Cold and wet conditions have returned to Sydney. and the mind turns to comfort food. Recently I prepared a pizza topped with a generous assortment of roasted vegetables and fresh mozzarella cheese. I pre-roasted potato, white sweet potato, fresh fennel root, pumpkin, beets, grape tomatoes and zucchini in the oven while my homemade pizza dough was rising. I rolled out the dough and spread it on my pizza tray. Then I removed the roasting tray of cooked vegies from the oven and three-quarter cooked my pizza dough. The vegies and fresh mozzarella were generously strewn, sprinkled with Greek oregano (rigani) and splashings of olive oil, and then returned to the hot oven. The cooked pizza was finally served with a generous spiral drizzle of homemade rocket and almond pesto and topped with fresh rocket leaves from the garden, but by then my camera was out of battery power, so you’ll just have to imagine how nice it looked – and, after the usual sanctifying mantras were uttered, how it tasted. This popular leavened bread, especially enjoyed in Punjab in north-west India and Pakistan, is cooked in a traditional coal or wood-fired clay oven called a tandoor. Many versions of this flat bread are found throughout central Asia, from Iran in the East to the Soviet countries in the North. The breads, enriched with milk, yogurt and butter, are slapped onto the inner walls of the hot oven where they cook quickly, partially puffing, and taking on a smoky flavour. The occasional charred spot from where the flames lick them adds a delightful crisp textured crust. This recipe calls for a household griller, which does a pretty good job. If you have a tandoor oven, all the better. Naan are traditionally sprinkled with kalonji seeds that are also known as nigella seeds and occasionally misnamed as onion seeds. Kalonji seeds are available at Indian and specialty grocers. Combine the yeast, sugar and warm water in a small bowl and set aside for 5-10 minutes, or until the mixture becomes frothy. Mix the frothy yeast mixture with the warm milk, yogurt and melted butter or ghee. Combine the flour, salt, baking powder and 1 teaspoon kalonji seeds in a large bowl, and add the blended wet ingredients. Mix well, adding a little of the extra warm water at a time until the mixture leaves the side of the bowl and becomes a non-sticky, kneadable dough. Knead for 6-8 minutes or until smooth and elastic. Transfer the dough to an oiled bowl and set it aside in a warm place for about 4 hours or until it is well risen. Punch the dough down and knead it briefly, adding a little flour if it is sticky. Divide the dough into 6 pieces and form each piece into a smooth ball. Place the balls on an oiled plate and cover them with plastic wrap. Allow the balls to rest for 10-15 minutes. Pre-heat the griller to the highest setting. Place a shelf 12.5cm (5 inches) under the heat source, and pre-heat your baking sheet. Roll and stretch a ball of dough into a teardrop shape, about 25cm (10 inches) long and 12.5cm (5 inches) wide at its base. Repeat for one more ball of dough and spray the bread with water. Sprinkle on half the extra kalonji seeds. Place the breads under the griller and cook them for about 3 minutes on each side, or until they rise and turn golden brown. Avoid placing the breads too close to the griller, otherwise the breads may not fully cook inside before browning. If you wish, allow the breads to become slightly toasted, with a few charcoal flecks. Remove the breads from the oven, cover them with a clean teatowel and repeat the procedure for the remaining breads. Serve the naan hot or warm. 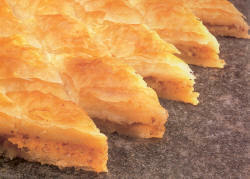 Baklava is probably one of the best known of all Middle Eastern sweets. In this delightful version of Turkish origin, sheets of buttered wafer-thin filo pastry are layered with nuts and baked; then they’re soaked in a lemon and orange-blossom flavoured sugar and honey syrup. My reply: Here’s my recipe for falafel. It is wheat and gluten free as well. Process the chickpeas in a food processor and mince finely. Scrape the minced chickpeas into a bowl. Fold in the herbs, spices, salt, and baking powder. Mix well, knead a little, and leave for a few minutes. Form the mixture into 14 to 16 falafel balls. Repeat until all the mixture is rolled. Heat a heavy pan or wok with ghee or oil to a depth of 6.5 – 7.5 cm (2½ – 3 inches), until moderately hot 180°C/355°F. Deep-fry 7 to 8 falafels at a time, turning when required, for 5 or 6 minutes, or until they’re evenly golden brown. If your pan is big enough and your heat source is strong enough, you can cook the whole mixture in one batch, but be careful. Remove and drain on paper towels. Cook the remaining falafel if there is any mixture left. Serve hot, as recommended above. IMPORTANT NOTE: The most important rule in falafel-making is DO NOT USE CANNED CHICKPEAS!! They will not work, they are cooked! You must obtain raw, dry chickpeas, and soak them, drain them, grind them, spice them, and then fry them. If you boil the chickpeas, you are wasting your time. The frying falafel will disintegrate in a spectacularly miserable mess. My Facebook page has less than 100 friend requests to go before it will not accept any more, since the ceiling is 5000 friends. Spring is here in Australia! The favourable weather adds lightness to our step. What better way to celebrate this new season than with a cookery adventure ‘far from the madding crowd’. A few places still remain for this great retreat to be held this coming weekend in rural Victoria. Here’s a group photo taken at our 2010 Spring Bhakti Yoga Cooking Retreat. Veda Priya (kneeling, far left) and husband Keshava (standing second from right) are full-time residents on the farm. Assisted by Manigriva (at the back, in yellow) and Gandiva (in white hat, back, fifth from right), they co-ordinate the day-to-day running of the farm. For those of you that haven’t heard of this event, Krishna Valley is in country Victoria, surrounded by State Forest. And if you don’t know your geography, the 200 acres of beautiful rolling countryside is a couple hours outside of Melbourne, Australia near Bambra and Winchelsea, not far from Geelong. The yoga of cooking is the theme of the retreat. There’s lots to learn, lots to eat, and great company. Here’s Jacqui, sister-in-law of Keshava, Lauren and her mother Lynn. Many retreats are held here, such as Vedic Astrology. Great accomodation facilities make it a real haven. And did I mention the spiritual food? Groaning banquet tables, fresh air, peace and quiet, uplifting yoga and great kitchen fun awaits. Don’t miss this last retreat for 2011! I grew up eating Bakewell Tarts – the archtypical sweet treat for those with ‘sweet tooths’ and ‘stiff upper lips’ (apparently there are surgeons that can fix that these days). Since the aforementioned tarts usually contain eggs, and since I have not eaten an egg since 1971, I pretty much gave up on ever tasting a Bakewell until yesterday. Trust fellow-food-blogger Sanjana to come up with a fraffly spiffing, googyless recipe, eh what! Here it is. Peaches are not back in season yet in Orstraylia, but I am sure you’ll come up with a substitute, like pears, mangoes etc. Or you can wait until the first peach appears in the shops in a few months time. Feast on this!